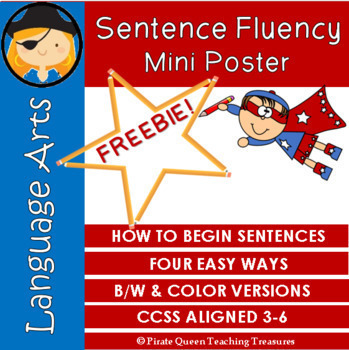 Use this mini poster when teaching students different ways to vary the beginning of sentences. Four types of beginnings are listed along with sentence examples. Make copies for students to keep in writing journals or binders as a reference. Post copies on the classroom wall and have copies available in your Language Arts center. The poster is available in color and black/white. For a more detailed resource to teach students how to vary sentence beginnings, take a look at this treasure! Sail to my store for more teaching treasures.